Pohnpei—Captain Lee Boone, Commanding Officer of the US Coast Guard’s “Activities Far East”, and Lt. 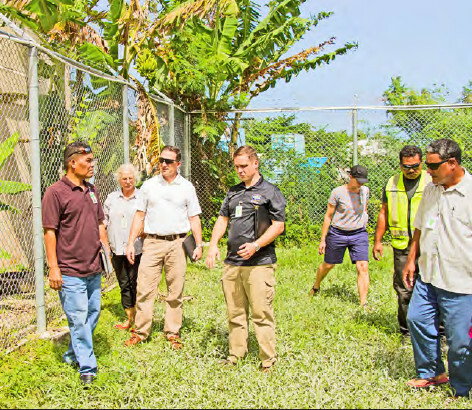 Commander Kevin Beaudoin, International Port Security Liaison Officer joined Pohnpei Port Authority officials this afternoon in a walk-through of Pohnpei’s Sea Port. The seaports of the FSM have been under a US Coast Guard issued Seaport Security Advisory since September of last year. The advisory essentially means that the ports don’t meet basic international security standards. It also means extra work for vessels that use the ports in the FSM which can mean greater shipping expense and delayed ships. Additionally, any vessel that uses an FSM port and then goes to a US seaport will have to meet more stringent security measures when they arrive at the US seaport because of the advisory. The walk through this afternoon and subsequent meeting with Port Officials was to see what progress had been made on recommendations that the US Coast Guard had previously made. During their visit to the FSM they will be conducting similar walk-throughs and meetings at the FSM’s other seaports. As Port Security Liaison Officer, Lt. Commander Beaudoin has been working closely with the FSM’s port managers and personnel to try to get the security concerns handled. He has met with varying degrees of success. So far, Pohnpei’s port has made the most progress and has been carefully working toward shoring up facilities and meeting the recommendations. According to the walk through today, the work is still not quite done but excellent progress has been made. This visit to the FSM was not the formal inspection that would be required in order to lift the Port Security Advisory. It was conducted to see if current progress was sufficient to warrant scheduling a formal inspection.